Here`s and old favorite…the Eastern Sour. Orange and lemon juices, sugarcane syrup, orgeat and then rye or bourbon. It´s drink number 20 in Grog Log and is also featured in Remixed where i also found the Western Sour which contains grapefruit juice and falernum. I find yellow grapefruit juice much tastier in mixed drinks than the pink one, it´s simply fresher and has that sourness which balances so well with sweeteners yet still contains that sour freshness. The Eastern Sour was made sometimes in the 50s by Trader Vic. He also made the London Sour (sub scotch for the bourbon) and Munich Sour ( cognac) These sours were made for the various Trader Vic`s restaurants. 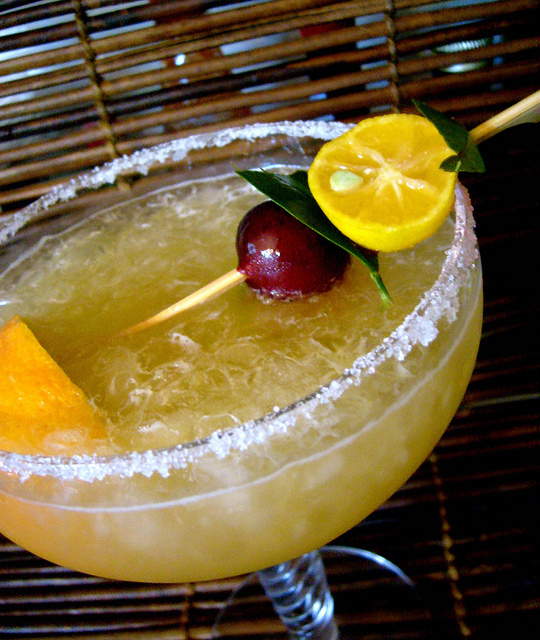 The Western Sour was featured at Steve Crane`s Kon-Tiki restaurant chain operating in Sheraton hotels across the U.S. Steve Crane and Trader Vic did really compete and in the end Vic did outlast Steve and the Kon_Tiki`s. I like both..but shame on me! – i`m out of bourbon…so it´s rye to go in both drinks, and i`m using Rittenhouse bonded. Also i found a few fresh kalamansi limes so i`m gonna use them in both drinks to see what happens. Shake well with plenty of crushed ice. Pour unstrained into a double old fashioned glass or short stemmed goblet. Sink spent orange and lemon shells into the drink. Since the kalamansi is both sweet and sour but a bit more on the sour side i decided to make a sugared rim on the glass to add some extra sweetness. I think it was very tasty with some tangy kalamansi juice in the Eastern Sour even though it doesn´t make itself very much noticed in this drink – just subtle. That said it was very very tasty. Shake well with ice cubes and por unstrained into a double old fashioned glass. As i suspected, white grapefruit juice and kalamansi limes like each other and plays together very well..and here the two together is da bomb! this drink is so tasty! 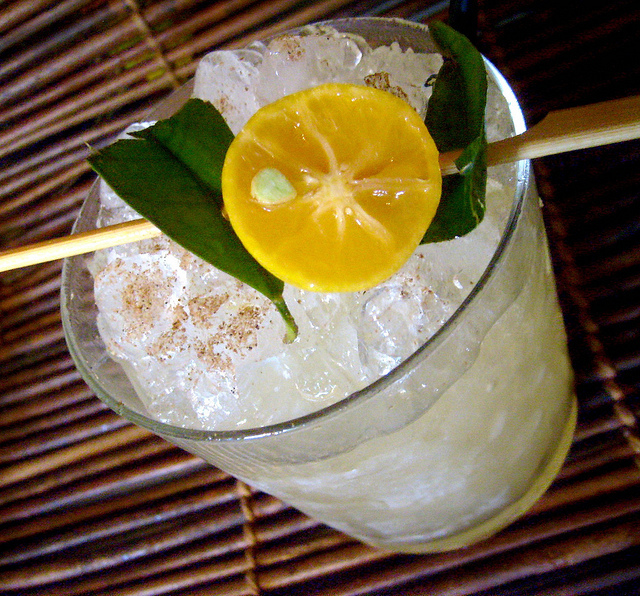 The kalamansi transforms the drink from quite average to one step higher. Otherwise the Eastern Sour is in my opinion better than the Western but when kalamansi is in the game it`s slightly the contrary. Interesting how the addition of just one thing can change things around! 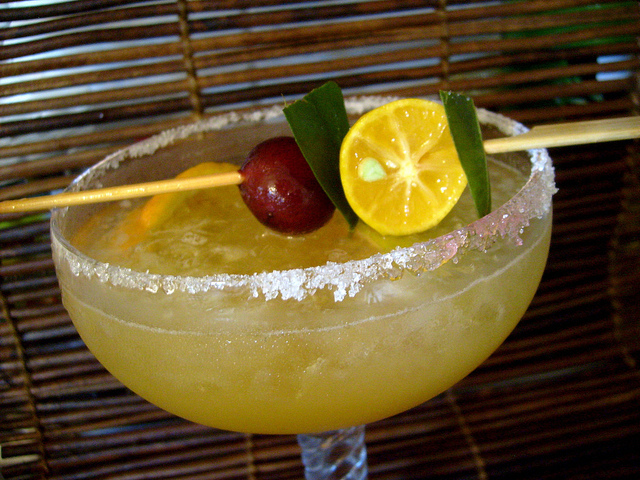 I think i need to go and get me a kalamansi plant so i can have fresh kalamansi limes and make these drinks all summer! Sounds very good, i have never tried mandarin lime before. You can´t get them here. Great recipe! I’ll try it with mandarine lime. I have lots of those at home right now and I believe it goes very well in this recipe. Thanks! gyr8or – nice to hear you like it! 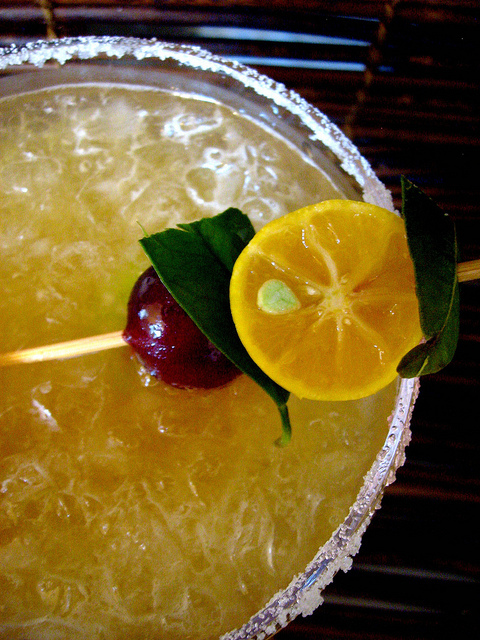 the eastern Sour is one of those good old classic Tiki drinks and the Western Sour too. I like them both. Tiare, we just had the Eastern Sour, and it’s wonderful. Whisky Sours in the US tend to be over the top SOUR, these were really nice, not too sour not too sweet…We’ve declared this recipe a KEEPER. By the way, I used Wild Turkey 100 proof Rye, I thought the pepperiness of the Rye, worked well with the sweetness of the rest of the ingredients. Micheal, try find it in nurseries and flower shops, ask for calamondin or calamansi plants. i hope you can find it, it really makes a difference. Really excellent post – this journey through the Grog Log is sublime. I loved the look of these two drinks when I saw them in Remixed, now I just have to make them. Now to try and find Kalamansi limes here in Belfast!